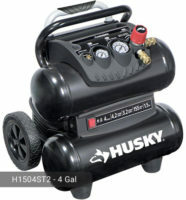 If you are the type of person who loves do-it-yourself (DIY) tasks, Husky has the right air compressor for you. 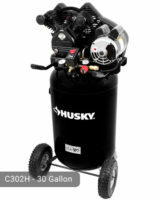 Husky 10 Gallon Air Compressor L210VWD is the excellent machine to use for DIY home, garage, or industrial shop tasks such as simple bolting/wrenching, brad nailing, automotive tasks, nailing, stapling, and many more. How does it do all these tasks? Well, it has an induction motor running at 1.5 HP which provides strong power for high-quality performance. Air delivery is 4.5 SCFM at 40 psi and 3.8 SCFM at 90 psi. Its maximum pressure is 135 psi. The power and level of air pressure definitely meet the minimum requirements of light-duty tasks mentioned above. The air flow is more than enough to power air ratchets and other similar tools. 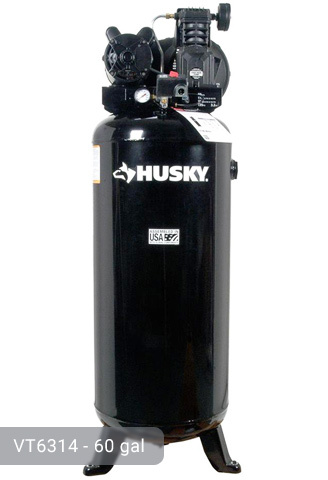 Husky 10 gallon air compressor has an oil-lubricated direct drive pump which ensures smooth pump operations. Because it is well-lubricated, you can expect a long-lasting performance. 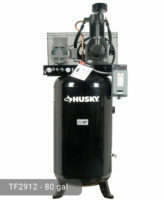 For the user’s convenience, the compressor has an oil sight glass that provides an accurate view of the oil level. There is no need for a dip stick that may not be too reliable. Also, the package comes with the required oil so no need to purchase for the first use. If you will need to change the oil, the synthetic blend is recommended. The tank has a total capacity of 10 gallons. It fills up pretty quickly so inflation of tires would not be very time-consuming. It is made of steel and is certified by ASME so your safety is guaranteed. To lessen the vibration when it is running, it has 2 rubber feet attached to the tank. Despite the huge capacity of its tank, it is still very portable. It weighs 78 lbs. With its 7-inch wheels, you can transport it along all types of surfaces. The wheels are not pre-attached but you can easily mount them in a few minutes. In terms of storage, you can save space because the tank is vertically oriented. It is very compact and stands at a height of only 3 feet. However, it is not as slim as the other models. Because of its oil-lubricated pump, it is not as loud as the other models. It is very user-friendly so you will have no difficulty performing tasks at home such as crown molding, quarter round trims, and installing base boards. The gauges may be small for some but they still provide a good view of the readings. To operate, you would need a 120-volt power outlet. The power cord is around six feet. This may not accommodate medium-duty tasks so it is also better to purchase a power extension. 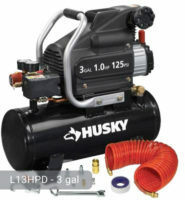 Husky 10 Gallon Air Compressor L210VWD is a must-have if you have a long list of DIY projects. It is now only $189.00 in local store (original price is $190.00) so grab your own machine now. This is indeed a great addition to your collection of DIY tools. 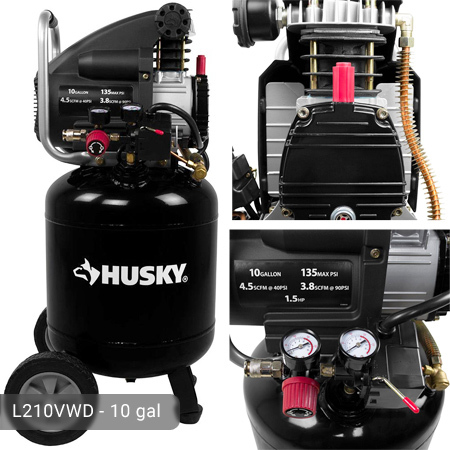 If you already own Husky L210VWD model or just want to buy it, feel free to share your review or ask a question through the form below. Just picked this one up today on pg 17 under lubrication it says to change oil after the first 10 hrs of use (for break in) then every 100 hrs after. Does this unit run on a 15 amp circuit OK??? My motor has a broken seal where do I go to replace it?